PON FIRST READING the below letter, I was shocked. Initially, I was shocked that such a letter, containing as it does “personal business,” would be printed in the Sacred Music Journal (Winter of 2002). That just seems like a really bad idea. However, as I pondered this letter, I realized that this was one of the best letters that could be printed, as it shows the type of struggles and hurt feelings that choirmasters must endure. The reader might be very surprised that I am not angry at the priest (see below). As a matter of fact, I see both sides of the “problem” or “argument” or whatever. This is nothing new. This happens all the time. For this reason, I have renewed in my heart the desire to create a series of articles on “Views from the Choir Loft,” formulating a type of “contract” between priest and musician. I don’t know how many articles I will write: maybe five, maybe fifty. I will think of some clever heading, which will make it easier for folks to find all the articles and read them in succession. Believe it or not, I really have thought about this subject A LOT over the years. I will explain my thoughts and opinions, which mainly come from real experiences in my life. However, for now, I will simply reproduce the letter, and invite you to read it over and think about it. If you prefer to read the original, it is here [pdf]. “As you may have already heard, Cantores in Ecclesia is no longer in residence at St. Patrick’s Church in Northwest Portland. The decision to leave was made in response to memoranda from the pastor, Fr. James Mayo, on the 7th of October. One memo contained his ultimatum regarding the replacement of Gregorian Introits and Graduals with opening hymns and responsorial psalms at the Saturday evening Latin Mass. In this memo he also gave deadlines for these changes to be implemented: Saturday, October 12 for the Introit and Saturday, October 19 for the Gradual. The other memo from Fr. Mayo forbade the use of the choir room for music lessons, effective Monday, October 21. “After much soul searching and consultation with members of the choir and board of directors, I decided that Fr. Mayo’s restrictions regarding the liturgy and the choir’s use of facilities were not acceptable. I notified him about this decision in a letter of October 17. At that time I also requested that the choir be permitted to sing through the month of October because services had already been advertised in our monthly newsletter. On the same day I got a further memo from Fr. Mayo informing me that the choir would be permitted to sing on Saturday, October 19, but that this would be our last Mass at St. Patrick’s. 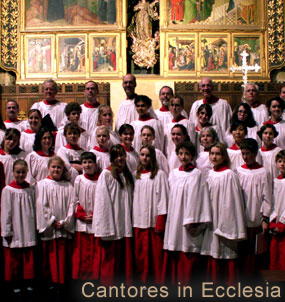 The website for Cantores in Ecclesia is cantoresinecclesia.org [url].